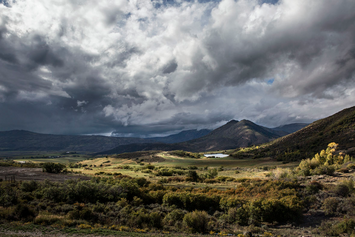 Water Talk is a series of conversations about how we’re “Killing the Colorado,” a multi-part investigation from ProPublica and Matter that tells the truth behind the water crisis in the West. Our water resources are highly variable: we have wet and dry regions; droughts and floods; competing demands among different sectors of society; and now human-caused climate change. All of these factors complicate the allocation of water, especially in regions like the arid West. So, we need rules. And rules — peculiar to the way the American West was settled — have been developed over the past 150 years to help divvy up a too-small pie of water. Among these rules are various versions of “prior appropriation” or “first-in-time/first-in-right,” which gives earliest users higher priority of use. But that set of rights to use water comes with conditions, including the requirement that water actually be used (“use it or lose it”), and that (in California at least) the water be used “reasonably and beneficially.” Now that California is in an extreme multi-year drought, new questions are being raised about whether water rights laws should change, and if so, how. When “rights” were given out, ecosystems weren’t at the table, and the band-aid provisions put in place to fix this problem are imperfect. Water rights must be reallocated to give the environment a legal share. Current rights are not adequately measured, monitored, or enforced, leading to lack of trust and confidence that the system is fair. Rights must be predicated on a willingness to have all water uses monitored. Exactly what is a “reasonable and beneficial” use of water should be more clearly determined and applied to provide an incentive for improving efficiency of use and reducing waste. If the current structure cannot fix these problems, we will have no choice but to explore more fundamental changes in our water rights laws. Have something to say to Peter or Paul? Leave a response at the bottom of this post. Our established system of water rights was created for the basic purpose of allocating an unreliable, often scarce, resource in a way that allows for economic development with a degree of certainty for those making the investment. Ironically, regulatory actions have created the “use it or lose it” mentality. Regulatory directives involving air emissions or water use set limits according to “historic levels.” Early adopters repeatedly get burned for their implementation of new technologies by having limits set according to the reduced levels resulting from their actions. 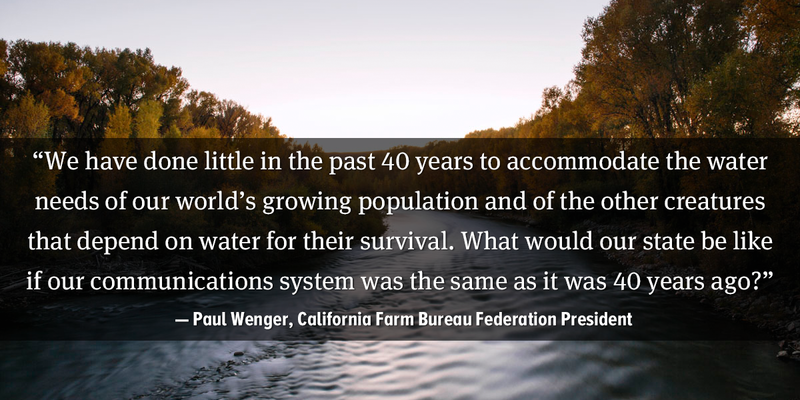 We have done little in the past 40 years to accommodate the water needs of our world’s growing population and of the other creatures that depend on water for their survival. What would our state be like if our communications system was the same as it was 40 years ago? A conservation-only approach regarding water supply cannot succeed in the long term, especially with increased demands. Consider surviving on the current finances you have for the rest of your life, without any additional income whatsoever, and you will soon realize it is imperative we grow the “pie” that Peter referred to. We have the ability to make a bigger “water pie,” but have fallen miserably short of planning for the needs of future generations. And a diversion into water rights reform will not yield one additional drop of water for California’s future; only hard thinking about new supply choices can do that. Agricultural land values depend upon their associated water rights. If those rights are threatened by our political failure to provide improved water supply and reliability, it will result in a financial crisis for farmers and ranchers. Hedge fund managers will replace family farmers. Generational farmers will give way to opportunistic investors. Is that what we want? 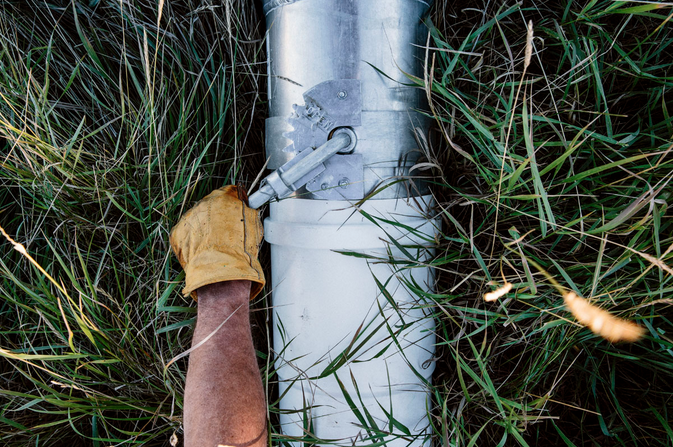 I agree our water rights system was created — and remains vital — for allocating scarce water. We can’t toss it out the window. But our system was designed for a different reality and its current implementation is flawed. How? We cannot afford to remain in the dark about actual water uses, but we still lack comprehensive water-use data. We cannot know if water rights are being respected and if water is being used “reasonably and beneficially” if we don’t measure it. Would Paul agree with the three problems I described initially? I also agree “conservation-only” isn’t enough. I don’t know anyone who argues that it is. But it’s wrong to suggest California “has done little in the past 40 years.” The state has made massive progress through efficiency: per-capita water use has dropped 55% since 1955. This astounding improvement has permitted our economy and population to grow without a big increase in water supply. Farmers get far more “crop per drop” today because of investments in better irrigation technology and practices. And great potential remains for more improvements: water-use efficiency is the fastest and cheapest way to manage the limited water we have. I also agree the overall “pie” can be expanded, but the old ways of doing this (building dams, taking more water from ecosystems, and pumping more groundwater) are tapped out. Indeed, we take too much out of the system now. We might build one or two more dams, but our water problems would remain. But there are new supply options: especially expanded reuse of high-quality, treated wastewater, storm water capture, and “conjunctive use” of recharged groundwater aquifers. Certainly we don’t want family farmers replaced by hedge-fund managers or opportunistic investors. But we’re getting that now and failing to improve our water rights rules will accelerate that trend. First, the ecosystem has taken political precedence over many water rights, without paying. Case in point: Don Pedro Reservoir was paid for by the city of San Francisco and Modesto/Turlock farmers. My water supply has been cut 60 percent from the usual 40-inch allotment (we normally use less), due to environmental flow requirements that benefit from stored water that the ecosystem didn’t pay for. So now I must use groundwater for the first time. Can’t farm without water, no matter the crop. Secondly, farmers can account for the amount of crop they produce with the water used. Is it reported? No. Is that changing? Yes. Is there a similar metric to account for gallons of water per fish? Peter, are you willing to admit fish flows aren’t resulting in more fish? Finally, “reasonable and beneficial” should apply to dedicated environmental water as well. Just putting more water in the system hasn’t resulted in more fish, and won’t. This isn’t a Field of Dreams scenario. Water rights were “allocated” because water supply was unpredictable, not always scarce. Ecosystem needs now trump water rights. Water development was designed for the reality that is more critical today than ever: providing for the needs of 7 billion people. Peter, what have we done beyond conservation only? Because of the restrictions on surface water, the “conservation only” mindset has created the groundwater problems we have today. You can’t conserve it when you’re forced to use it or lose it. How do we provide for the needs of 7 billion people without capturing additional fresh water? I agree any decisions to commit water to ecosystems should lead to environmental improvements — they should also be “reasonable and beneficial.” I hope that you will also agree that the amount of water given to ecosystems should be larger than zero — that society cannot simply take it all for our urban and agricultural needs. Our water rights system effectively gave away all the water and reserved nothing for the environment; it follows directly that some modifications to water rights is needed to protect ecosystems. If you agree with that, then the question becomes (somewhat) simpler: how much should be allocated to different users? But even leaving the environment out of the discussion, existing water rights rules do not promote efficient or effective or equitable use of water. I don’t agree that “fish flows aren’t resulting in more fish.” Fisheries biologists say these flows are critical for preventing further deterioration in ecosystem health: indeed not all promised ecosystem water is even being delivered. And the few efforts to commit water for ecosystems have not diverted much water from other water rights holders. Some — certainly — but some of this water should never have been diverted from the environment in the first place. It is entirely unfair to claim that “conservation” created the groundwater overdraft problem. Without past efficiency improvements (urban and agricultural), we’d be in a far deeper hole. Overdraft results from demanding more water than nature provides (even without drought). If we built another round of dams, any “new” water would be a tiny fraction of current overdraft and we’d still be living beyond our means. California will never provide all the food for 7+ billion people. Thankfully, we don’t have to. And even with realistic limits on water, we can still have a strong agricultural sector. I’m astonished anyone would claim that ecosystems get zero water. There’s no water for the environment?? Mother Nature supplies our state with 200 million acre-feet on average per year. We capture around 78 million acre-feet, of which 40 percent is used by agriculture and 10 percent in cities; the environment gets the rest. It’s absurd to deny that water commitments for the environment have not diverted much water from other rights holders. Ask the junior rights holders who have zero water for a second straight year, or the senior rights holders who may face further reductions, because water has to be kept in Lake Shasta and other reservoirs to protect salmon. In my area, the Stanislaus River ran high the past two springs to push out young salmonids, many to be consumed by predatory striped bass — and it ran high last fall to assist returning salmon to spawn. The water they swam in was stored water, not natural flows. New Melones Reservoir has been drained of its stored water from 2010–11. That water was spent for fish, at the cost of human needs. During the 1976–77 drought, the Stanislaus River ran dry for most of its length upstream of the delta. When the water returned, so did the fish. The environment is resilient. Without adequate planning, we are allowing our current austerity to diminish our water resiliency for human needs. Peter, you contradict yourself by saying flows are critical to prevent further deterioration. To me, that clearly says current practices have not had beneficial results. Conservation has certainly contributed greatly to groundwater overdraft, because “conserved” water was used in place of new water development to meet the needs of a growing population. I’m drilling wells now because of environmental restrictions to surface water we have in Don Pedro Reservoir. You misunderstand me. Of course ecosystems don’t get “zero” water. We’d be in a much deeper hole than we are already in. I was trying to get you to explicitly acknowledge that some water for the environment deserves to be a part of any overall sustainable strategy. The environment has no explicit water “rights” under our current system. Any modification to water rights, including the development of water markets, will have to find a way for the environment to participate. You overstate the flows devoted to the environment, especially during the drought. Shortages to agriculture aren’t due to environmental protections — indeed, many protections have been waived (or ignored) during the drought. For example, some claim current water shortages are due to protections for the much-maligned delta smelt, which is at danger of extinction. Yet there were no limits to delta pumping during 2014 and 2015 due to the smelt. Instead, limits on Delta exports were due almost entirely to the need to protect water quality for crop irrigation and drinking water. And you’re not drilling new wells because of environmental restrictions, but because California simply hasn’t had sufficient rain and groundwater is being severely over-pumped. If there were no environmental protections at all (which I hope you don’t believe is the right policy), farmers and cities would still be under restrictions and cutoffs. Of course flows are critical to ecosystem protection. Indeed, higher flows may be needed, along with improvements in quality and timing. I’m not willing to risk sacrificing the existence of species to provide a bit more water for farmers or cities. I hope you aren’t either. Let’s protect agriculture and the environment together, by making commitments for basic protections and water supply reliability, while encouraging the most efficient use of water we can. The drought only highlights long-standing and unresolved water problems. This year, more than 400,000 acre-feet of water was lost to human use from reduced pumping at the State Water Project facility in the Sacramento-San Joaquin Delta, due to Endangered Species Act biological opinions and the attempt to break a “turbidity bridge” that could have introduced delta smelt into the pumps, according to the San Luis & Delta-Mendota Water Authority. This is fact, not hyperbole. You say you aren’t willing to “risk sacrificing” species’ existence. We agree that environmental protections are important, but at what cost? What are you willing to risk? It’s really easy to come up with solutions when someone is not personally invested with their financial future in jeopardy. Farmers face precisely that risk of losing their future through changes to the water rights system. Our system of government is based on rights. The environmental community has successfully stopped prudent water resource development for our growing population and now wants to blame those who own historic water rights for the lack of developed water. We need to monitor water, but not to arbitrarily give “conserved” water to other uses at the expense of prudent increases in water development from desalination, water recycling, stormwater capture and yes, agricultural efficiencies. But conserved water used in place of “new” water for a growing population equals smoke and mirrors.